Idle rollers with grooves made directly on the steel tube are intended for round belts transmission as a very simple and economical solution. The belts should have a section of Ø 4-5 mm or max. Ø 8 mm. 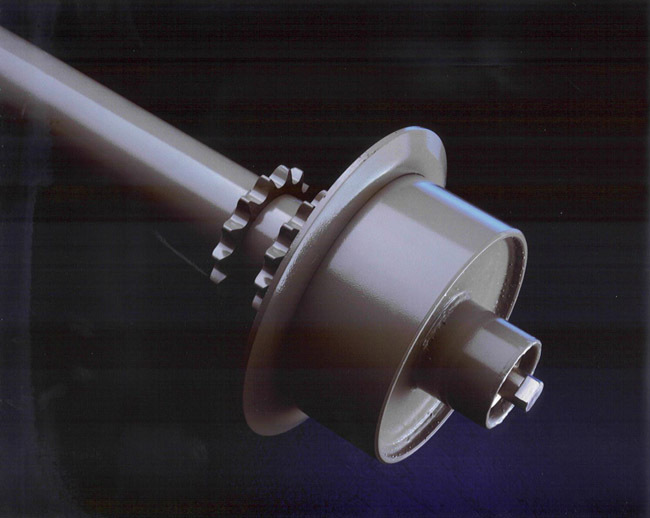 Rollers may be “GL, GM and 117” series in execution “E” (1 groove) or in execution “F” (2 grooves), with standard steel tube “N”, with electrolytic zinc-plating “J” or PVC coating “P”. Since the handling speed may be high, even though with restrained loads, particular care shall be taken in choosing the rollers in relation to the expected dynamic stresses. Although not special, information on this design is given. The rough or zinc plated steel tube “N” or “Z and J” rollers with “D” values as per table, can be covered with a soft, elastic and smooth surface (hardness 73 ShA) grey colour (RAL 9006) PVC (Polyvinylchloride) plastic tube, particularly resistant to chemical agents. It is normally used to protect the roller surfaces and mostly to avoid scratching painted, enamelled, smooth, etc. load, and in some cases to increase friction. The PVC lagging is simply fitted on the tube with excellent coupling thanks to elastic tightening. Application temperatures ranging from -10°C to +50°C. In gravity or driven conveyor systems, where the necessity arises to guide or contain the packages handled, rollers, with welded flanges on the tube are employed. All rollers are with steel tube and diameter “D” as per corresponding table, with 1 flange (H exec.) or 2 flanges (W exec.). For this design, zinc plating is foreseen only in “J” execution. Lagging with 70 ± 5 Sh.A hardness, with surface turned to 3 mm minimum thickness. On request the lagging can be with different hardnesses or thicknesses or with glued rubber, Adiprene, Neoprene and Silicone compatibily with the number of rollers requested. Polyurethane lagging with 90 ± 5 Sh.A hardness, orange colour, a material which is particularly resistant to cuts, wear and abrasion. Hardness, colour and thickness can be supplied with other values on request. Rilsan coated: heat treatment based on Rilsan Polyamide powders of light grey colour, with particular resistance characteristics to chemical agents and wear.